11 1/4 x 8 1/2 in. 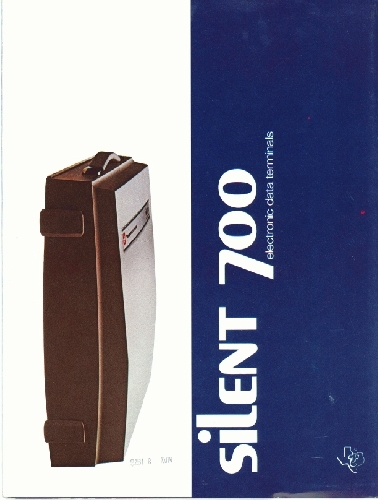 The brochure introduces the Silent 700 as portable data terminals that have "briefcase mobility" and send-receive keyboard capabilities. The brochure opens window shutter style with the half-page, left flap overlapping the full-page right flap. The left flap is white and shows a color photograph of the 745 model enclosed in its carrying case, and the date "May 3 1976" stamped at the bottom edge. The left flap's reverse and the right flap are dark blue with the company logo and the product name in large white letters on the right. The back cover is also dark blue with white lettering featuring color photographs of the Silent 700 models. The centerfold opens to color photographs of the Silent 700, one model enclosed in its carrying case, another open. A separate page, inserted at the centerfold, features the Silent 700 735 model, showing color photographs of hands typing on the keyboard and a woman walking with the carrying case. This page, printed on one side only, also displays the company name, logo, domestic and international addresses. Text contents include: Lightrweight: $1995/13 lbs. ; Heavyweight: capable/reliable; Models 743 and 745 general specifications; Other "Silent 700" heavyweights: Automatic send-recieve terminals; Receive-only terminals; New portable data terminal from TI:25 pounds...$2595.